This distinctive beauty relies on a little illusion for its dramatic look. The stunning diamond centre, placed in an incredibly fine setting, is surrounded by a thin space that drops under the stone and creates the appearance of a deep black band. 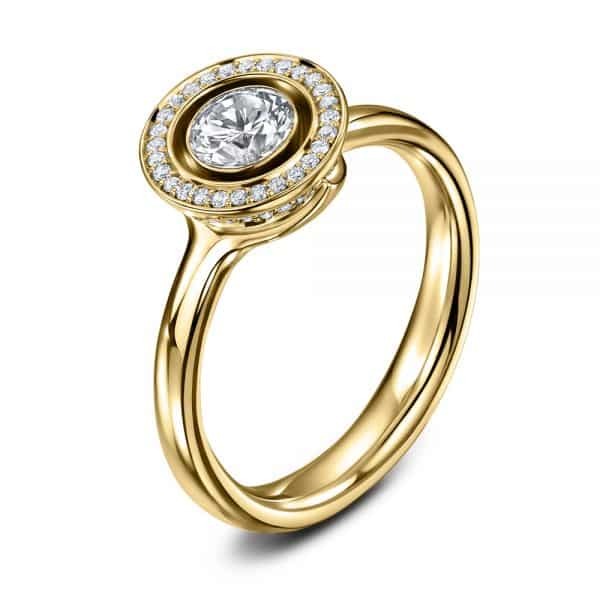 Beyond, a double halo of sparkling diamonds adds to the contrast – the diamonds are all the brighter for the dark, and the lacuna, or space, all the deeper and more theatrical for the brightness of those stones. A sparkling diamond centre G VS2 set in pristine precious metal. Available in a host of gemstones including diamond, coloured diamond, sapphire and ruby, and in platinum or 18ct white, rose or yellow gold. The Lacuna is also available to buy with a matching wedding band.